This consecrated oil vial is made from purplehart wood with a 10-k gold plated cap and matching keyring. Inside is a glass vial to hold the consecrated oil, essential oil, perfume, or whatever else you like. Made to customer specifications, this is about 3" long and a little bulkier than most of my consecrated oil keychains. Specify your choice of hardwoods, the shape you want, and order one like it for $25.00. Made from purpleheart with a cork stopper and glass vial, this wood pendant can be used to carry perfume, essential oils, or anything else you can think of with you on the go. Each is unique, made to customer specifications and from the hardwood of your choice. Purpleheart, also sometimes called amaranth or violet wood, and comes from several species of tropical trees native to Central and South America. The heartwood is a light purple when cut, and darkens upon exposure to sunlight, reaching first a darker purple and eventually a brown with a purple cast. It is hard and strong, and takes attention when turning, requiring sharp tools, gentle cuts, and careful sanding. A pendant like that shown can be ordered for $25.00. Made from solid hardwood with a cork stopper and silk laniard, this Essential Oil Diffuser Pendant will allow the essential oil placed inside to seep through the pores in the wood and diffuse, allowing you to reap the benefits of essential oil at all times. The wood pictured is purpleheart, also sometimes called amaranth or violet wood, and comes from several species of tropical trees native to Central and South America. The heartwood is a light purple when cut, and darkens upon exposure to sunlight, reaching first a darker purple and eventually a brown with a purple cast. It is hard and strong, and takes attention when turning, requiring sharp tools, gentle cuts, and careful sanding. These consecrated oil vials are available as a keyring like that shown, or on a black silk laniard to wear as a pendant. With natural hardwoods finished to a nice sheen, and gold plated components, each is a unique and practical work of art. 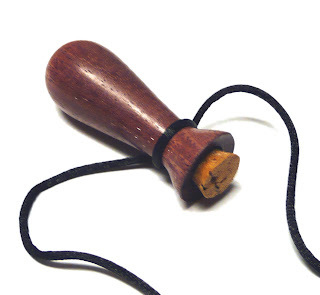 The second vial is a unique piece showing the lighter sapwood and the darker heartwood. I love working with walnut because of the rich hues and the smooth shiny finish that is so rewarding for a job well done. Walnut wood is hard, dense, tight-grained. Cutting it on the lathe is like carving really hard chocolate. It smells kind of sour when cut - I guess that keeps me from wanting to put the shavings on my ice cream... This piece shows both the lighter sapwood and the normal dark heartwood. Walnut has long been a favorite for gun stocks, and also popular for guitar bodies. This essential oil vial keychain is made from Oregon Myrtlewood and 10k gold plated parts. Inside is a glass vial ideal for taking essential oils with you on the go, and to do it with class and style. Oregon Myrtlewood, also called California Laurelwood, is a hardwood with a wide variety of colors depending on the minerals in the soil where it is grown - from light tan to dark brown, olives and reds, and blacks from spalting. It is noted as one of the world's most beautiful woods. Each one of my oil vials is totally unique. Shapes are custom made to the customer's specifications. Order your own practical work of art for $25 today. This Consecrated Oil Vial for keychain was made from Ambrosia Maple, and made to accomodate those who have large fingers or prefer larger keychains. As with other oil vials, the keychain and lid are 10-k gold plated, but unlike other oil vials, the end away from the keychain is solid wood instead of capped with a gold cap. This allows longer, larger diameter vials. Contained inside is a glass vial with stopper to hold the oil (or perfume or whatever other liquid you need handy). The shape can be varied to meet your specifications, and you can choose from virtually any wood I make pens from. Cost from materials in stock: $25.00. Custom Wood Photo Jigsaw Puzzles are one of my favorite gifts to send to friends and family with young children or grandchildren. Little ones will play with these for hours and still throw a fit when you try and put it away (just what you needed, right?). The photos are protected by a hard plastic, and permanently mounted to high density fiberboard for a sturdy, heirloom-quality wood toy that has a classic feel. Send me a digital photo or artwork (non-copyrighted, of course) and I'll get to work. Cost for 8"x10": $20. Larger sizes available on an individual basis.